Campaign for the American Reader: What is John Woestendiek reading? The current featured contributor at Writers Read: John Woestendiek, author of Dog, Inc:The Uncanny Inside Story of Cloning Man's Best Friend. For most of 2009, I was reading almost entirely dog books – partly in connection with research for my book, partly because I produce a dog website, ohmidog!. 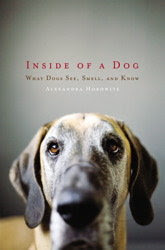 The one that stands out in my mind was Inside of a Dog, by Alexandra Horowitz, which provides a lot of insight into what makes dogs tick, and how dogs make us tick. For most of 2010, I’ve been on a steady diet of John Steinbeck. He has always been one of my favorite authors, but after finishing Dog, Inc., in May of 2010 – inspired by him, and by being unemployed – I took off on a road trip across America (two laps) with my dog, Ace. "Here is John Woestendiek at his best, sniffing along a trail to find a fascinating story you never heard of, and writing it in a way you'll never forget." "In Dog, Inc. John Woestendiek deliciously skewers the unholy combination of consumer culture, emotional indulgence, and scientific chicanery that lie at the heart of the cloning movement, and yet somehow, in the process, he reminds us why we love our pets so much to begin with." "It's a shame we can't clone more John Woestendieks! Dog, Inc. is one of the best books I've read in a very long time." "John Woestendiek's outstanding look at dog cloning explores what goes down when science, personal loss, and financial opportunism collide." "Dog, Inc. explores the curious history of pet cloning, from its roots in a 1928 experiment in which a German biologist replicated a salamander, to the present, when scientists are only too willing to help doting dog-owners reanimate their canine companions." Visit John Woestendiek's website and blog.